Unfortunately, my three-year old put a shiny disc of her own into it: a plastic toy coin. Well, it does say "Play Money" right on the front. Right in the drive slot. I figured my Wii was a goner for sure. I set about opening the thing up to remove the coin, but got stumped by these custom screws, kind of like a Philips head, but with three prongs. 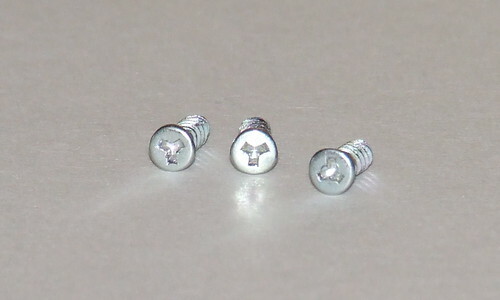 Turns out these are called "Triwing" screws and they're specifically designed to keep end users out of the machine, on the theory that these are not widely used screws, so most people won't have the means to unscrew them. True, it slowed me down a bit. I had to order a kit from Thinkgeek that has driver bits for every console on the market. Opened it up, got the coin out, and the Wii still works! But, surely these belong somewhere, don't they?